How would you define a portrait of a woman? One month ago I promised to feature one artist per month -if not more- who is not a cis white male. This desire arose as women’s rights, trans rights, gay rights and even children’s rights have been threatened under a Trump Presidency. 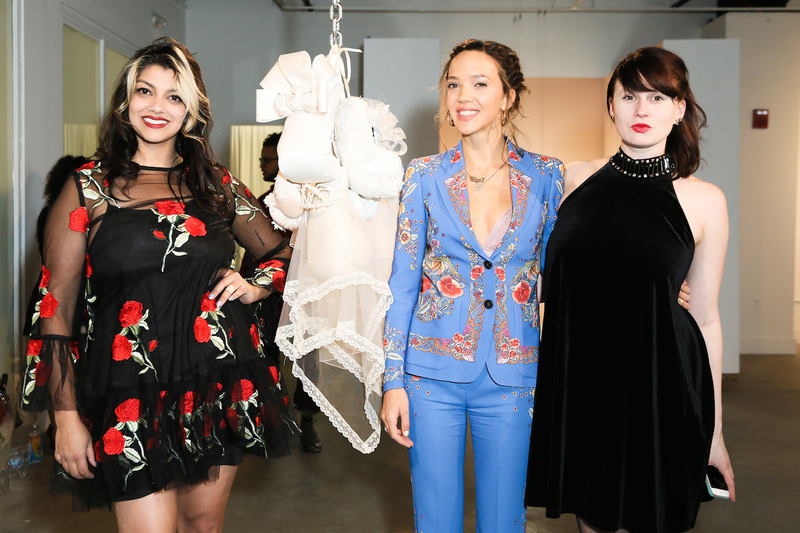 There couldn’t be a better artist to fit this role, or a better venue to house these works then Zoë Buckman showing “Imprison Her Soft Hand” at Project for Empty Space in Newark. The exhibition is part of the second phase of GRAB BACK: PES Feminist Incubator Space, an initiative started by the Founders and Co-Directors of Project Empty Space, Jasmine Wahi and Rebecca Jampol. Continuing in various phases until June 2017, GRAB BACK is focusing on artists who bring attention to marginalization, lending a platform for those who don’t want to whisper, but rather be heard. 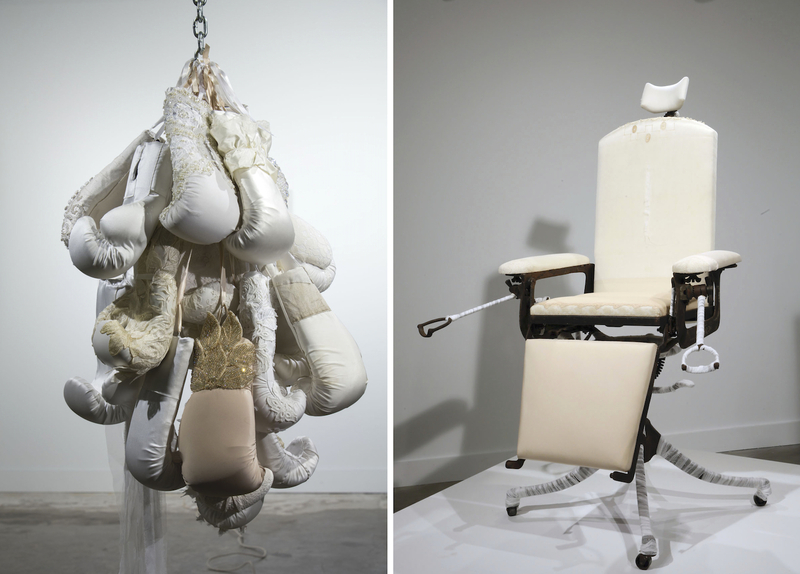 Such is the case with artist Zoë Buckman, who uses clothing, embroidery, and sewing as a way to simultaneously embrace and expose traditional female tropes. Originally from East London, the artist has been based in the United States since the mid-aughts. Having worked with embroidered text on women’s lingerie -she is particularly fond of the Notorious BIG- the selection of work on view in Newark from a new series titled Let Her Rave, utilizes discarded wedding dresses as canvas. In deconstructing the dresses, Buckman trades one trope for another wherein something that can be occasionally associated with weakness becomes an object that is always associated with strength. The symbolic weight and the physical act of boxing is a faithful representation of sport. It is violent, but organized violence, not senseless but rather calculated and rife with tactics and choreography. It also, has its’ origins with the male body. Buckman, who practices boxing, is part of a feminist wave who have agency over a sport that was once gender specific and lessened the perceived expectation of what a body looks like in the ring. Other artists such as Cheryl Pope and Paul Pfeiffer come to mind; dealing with a performative body in space (Pope) and the result of what happens in the ring when an opponent is removed (Pfeiffer). 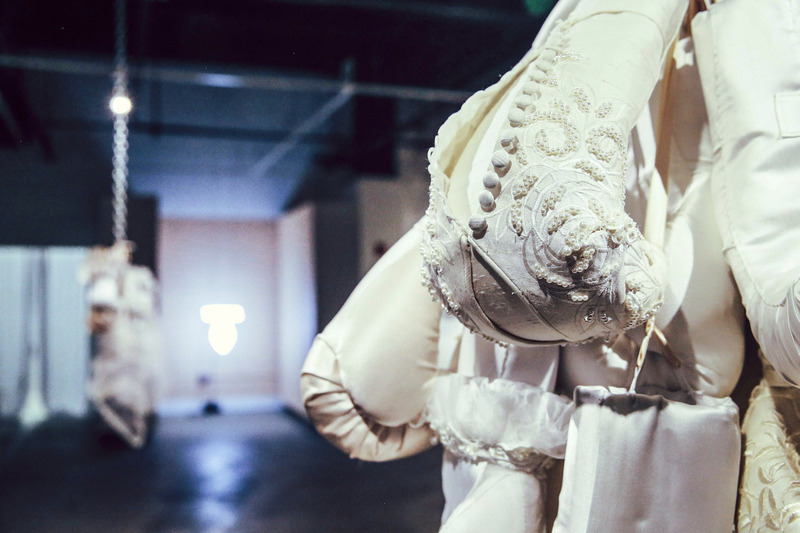 In “Imprison Her Soft Hand” Buckman’s ornate boxing gloves feel less like discarded objects after a match and more like portraits. A series installed on the far wall features individual gloves, encased in clear, Plexiglass boxes. Rather than feel completely sculptural, they embody and become what could be family heirlooms, poised for a time when nostalgia will take over. They are portraits of a great-aunt, grandmother, cousin and sister. Similarly, as to how a wedding dress is worn once and then archived, the gloves represent a woman from the past, her body no longer recognizable in this new form. Yet, do portraits of a woman need to come from a place of pain and discomfort, whether metaphorical or actual? 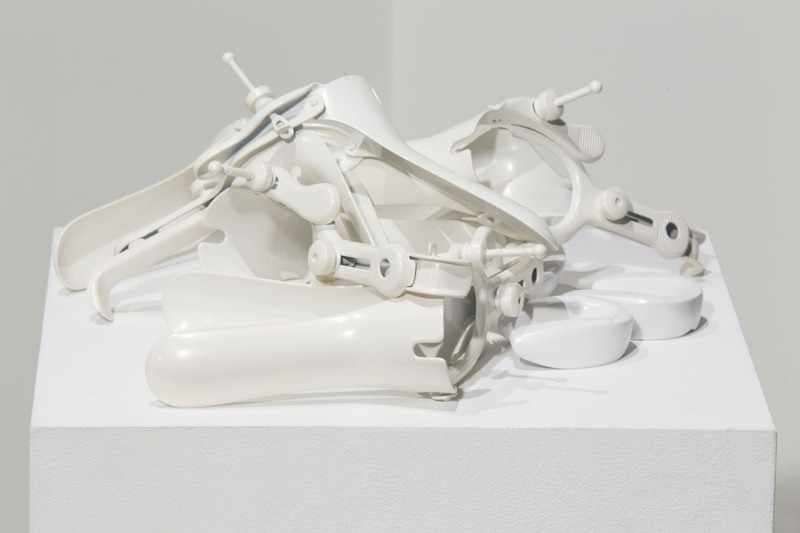 In this instance what the artist is striving for is a reclamation of tools at once used against us and now, in this instance, used to decorate our homes, serving as a reminder of what we have gone through and where we have come. Even if the road has been paved in gold, it is often going uphill and requires a certain amount of energy just to walk. This is life. Historically, the work may not be breaking ground or adding something new to the conversation but in fact is extending the dialogue and speaking to a millennial audience. Rather than allow for a period at the end of the sentence, Buckman reminds us that this, amongst so many difficult conversations still needs to be had. When looking at a word, it may appear quiet, however once spoken, is given life. Artwork can also appear hushed. Yet if one truly takes notice, every piece carries an utterance. What the work says, depends on one’s relationship to the past, and how closely he or she is willing to listen. Zoë Buckman, “Imprison Her Soft Hand” is on view at Project for Empty Space in Newark with hours Monday through Friday 11am-6pm.